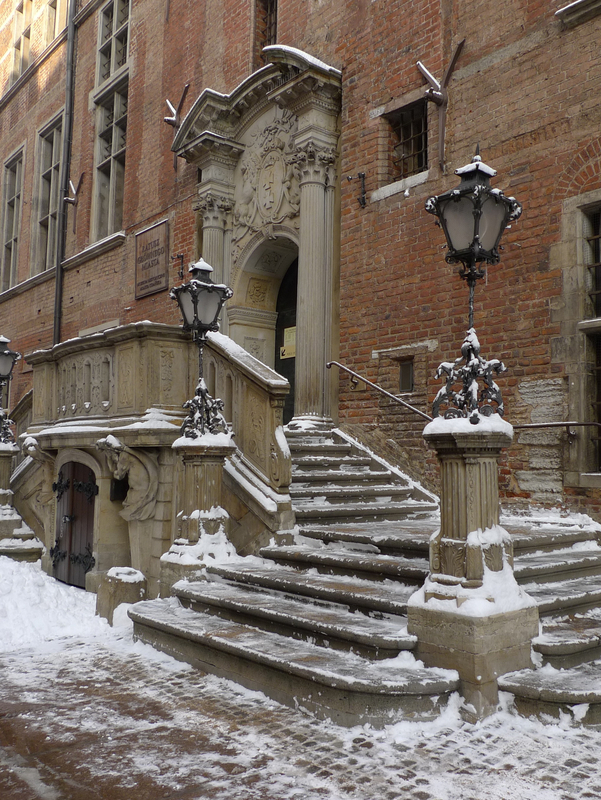 Oh, the slippery steps one must take to get into the Gdańsk City Hall… quite literally. At noon the bells on the City Hall’s tower ring to the melody of Rota (you can listen to the sound here), a Polish patriotic song written by Maria Konopnicka and Feliks Nowowiejski in 1908 in response to heavy Germanization actions in the Prussian Partition. After the fall of the Communism in Poland in 1989 the song was even proposed to be a Polish national anthem along with Mazurek Dąbrowskiego. The latter was finally chosen, most likely because it has less references to Germans, Russians, or God for that matter. Still, it’s a bit sad as Rota has a much more elevated feel to it. This entry was posted in Gdańsk, History, Poland, Rota, Travel, Winter and tagged Gdańsk, History, Poland, Rota, Travel, Winter. Bookmark the permalink.